Content warning: this post discusses, with graphic detail, PTSD, mental illness, and suicidal contemplations. On some days, we awaken feeling extraordinary. Our obstacles seem finite, our capacities infinite. On such days, our inner critic dies. On such days, hope is born. On such days, we dream. But then suddenly, life fr a ct u r es. 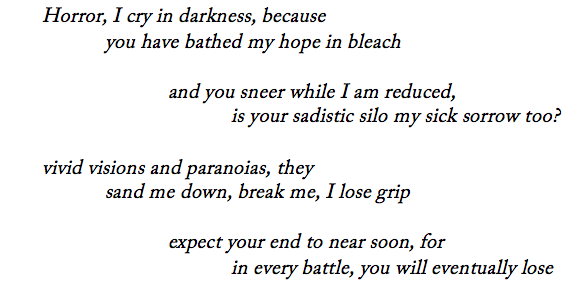 Why I wrote this poem, you will soon understand. My best friend has struggled with mental illness for a long time. To offer my support, I would read blogs and stories from recovering people, register in national programs and local support groups for friends of people in recovery, talk to my friends recovering from mental illness, consult mental health professionals, and more. But regrettably, my desire to be there for my friend eventually manifested as a desire to always be her go-to — to transcend understanding her struggle, rather internalizing it, thereafter alleviating her pain living with it. Empathy, a paragon of strength, was my greatest weakness. My fighter instinct —I’ve got this situation under control — was the very factor intercepting my ability to ask for help, to provide objective, necessary help. Through this process, I neglected my own self-care and need for support. I was the same boy who, during my freshman year of college, suffered from anxiety but disregarded and skipped my Counseling and Psychological Services (CAPS) appointment. My Winter term senior year, the toll became increasingly apparent: in the activities I joined, the friendships I grew, I felt my mind and body disjoin — my thoughts remained with my best friend’s pain, always. As my friend declined by the day, so did I; my anxiety worsened, my reason and judgement fading alongside, paranoia soon permeating my every space: classrooms, libraries, off-campus eateries, my own apartment — Is she okay? Is she hiding something again? Oh god — I forgot to check in on her today. Still, I avoided seeking help. Time’s progression accelerated logic’s erosion: I not only began to internalize her pain as my own; I stopped responding to it altogether. Then, one night, everything changed. I had just returned home after a taxing day. My best friend was over to study. Hours in, as I sat at my desk, headphones blasting my study mix, I turned around only to watch my friend progressively turn suicidal. I was in excruciating shock. I grabbed my friend and I broke down. If I had known and followed protocol, I’d have called 911/crisis response the moment that happened. But I failed to do so. Paralysis overtook me. Seeing the life in my friend’s eyes gone crushed me. My unrelenting tears splashed against her cheeks, giving rise to a cascade which trickled down her face. The night eventually ended with me embracing her tightly as we both cried ourselves to oblivion — she, into a state of deep sleep; and I, into a prolonged, never-ending consciousness. There are far more details and background to this episode, which I have intentionally omitted, for they are too painful and difficult to re-experience, let alone read. Night became day. After speaking with my mentor, an associate dean at Northwestern’s medical school, I met with our college Dean and reported this episode as an emergency. He filed a report and, within minutes, called her. She texted me, “Did you tell them.” I didn’t respond. I was afraid she would think I betrayed her. Afraid that she would never talk to me again. Afraid that, were a similar episode to occur again, she would never tell me. Thankfully, from that day onward, she began a therapy program, stabilized, and embarked on a hopeful path to recovery. There were no such episodes ever again. Her progress continues in the upward direction. I am thankful for her resilience and courage, every night. Just imagine, for a second, an exceptional person in your life. Perhaps a family member, partner, or best friend. Someone you know you can count on. Someone who infects you with contagious optimism and happiness. Someone who talks, laughs, sobs, feels, creates, dreams with you, thinks like you, imagines like you, stands up with you on your good days, sits down with you on your bad days, and stretches your mind to new dimensions. Now, imagine watching that same person decline by the day. Imagine trying to help them, trying everything in your power to give them hope, but no matter the hope given, they see no point in living anymore. But soon, the twitching escalated, and along with it, nightmares which woke me up multiple times at night — sometimes at 3, 4, 5 am. An overwhelming sense of fear and paranoia would keep me awake — often without basis — and I would stay awake in my living room, sitting in complete darkness, falling asleep on my couch once exhaustion hit me again. I grew excruciatingly sleep deprived. I began missing classes and deadlines, withdrawing from social circles, taking more naps throughout the day, and lying to my friends about how much I slept. My professor had made clear in her syllabus I would fail if I missed another class period, preventing my graduation. My friends sometimes got frustrated with how often I napped. But I couldn’t help it. My anxiety drastically grew in social settings. During “Second-Look,” the day all prospective medical students visit Northwestern to see if it’s an appropriate fit, I wanted to run home and be alone. I desired total, fundamental isolation from everyone. But there was only so much internal turmoil my human mind could suppress before my situation spiraled out of control. Soon, my anxiety became utterly volatile and triggered panic attacks. When I was at a friend’s apartment in Chicago for a fundraiser dinner for an Indian school named Shanti Bhavan (please watch their recent documentary on Netflix), I read a question about suicide in a game book. My heart rate escalated rapidly. I excused myself, feeling incredibly uneasy, went to the bathroom, turned on every sound I could — toilet flushing, water running, air ventilator buzzing — and broke down crying. “Oh God, oh god, please. Oh god…” I slid down, back against the wall, and collapsed to the floor, hands pressed to my forehead. I felt scared, caged, and alone. After a few minutes, I washed my face with cold water, went back into the living room, and continued socializing as if nothing happened. To nearly everyone, I was fine, for I engulfed my inner chaos under a false veil, my “I’m fine” façade to the outside world compelling. My Facebook profile, after all, only reflected happy times. My rare public self appeared in pristine condition. I didn’t tell people for two reasons. First, because I felt like a burden. I didn’t want people to be overly concerned about me. “I’ll get through this on my own. I’m a fighter. This is normal,” I said time and time again, to assuage myself. There was my fighter instinct once again. Second, out of the friends I told, only a very small fraction checked in on me. This angered me, and I struggled while vacillating between feelings of love and let-down. I wanted them to reach out. I wanted them to check in. I wanted reciprocity. Perhaps this was just my ego creating expectations. I soon visited CAPS and was referred to a therapist at an off-site facility named Urban Balance. My therapist worked with me to make sense of what I was experiencing. The night I broke down in Chicago: “flashback.” The night at my apartment: “panic attack.” The social isolation: “aggravated anxiety.” None of it made sense to me. I was soon told I had, along with at least 3.5% of the rest of the US population, acute post-traumatic stress disorder (PTSD). To relate, envision: you’re walking alone in a hallway, about to turn around the corner when suddenly, your friend jumps out and scares you. That “shock” you feel — what if it were to drag on for hours? What if it were to return randomly, your mind replaying the exact moment your friend jumped out at you? What if you couldn’t escape it in your dreams, too? Life became excruciatingly challenging, balancing between my self care while avoiding my best friend’s guilt — this was not her fault. I tried everything: meditation, music, dance, running, chanting. I read books like The How of Happiness and The Happiness Hypothesis. I took hot showers daily. I engaged in positive reappraisal. I watched YouTube videos on resilience. Yet, I struggled. Yet, my symptoms continued. Yet, there were days I couldn’t find the motivation to wake up in the morning. And it is thus I realized, over a few weeks: though the mind is indomitable, it is immensely unpredictable. Mental health exists in flux, and we are perpetually oriented at a dynamic point along a spectrum. Through suppression and lack of self-care/support, I had developed compassion fatigue, and rendered myself — with the appropriate mix of sleep deprivation, physical exhaustion, and trauma — more vulnerable to mental health challenges along this spectrum’s polarities. I struggled to write this email to you or tell you over the past weeks, but I’ve been going through post trauma mental health problems… I am sorry to do this, but I would like to take time off from class today and rest. I would like to see CAPS and feel temporarily relieved from academic pressure… I should have informed you earlier, but my priorities and life itself have been jumbled lately. I hope you will understand. Thank you for your patience. She not only sent me a note filled with empathy and assurance; she worked with me in and out of class for the rest of the term to catch up. Another professor even continued to check in on me. Through my therapist’s advice, I started practicing “grounding” — intensely concentrating on and writing characteristics about the surrounding environment as one feels a panic attack coming. I then told more of my friends details of my struggles, sent people articles, taught them how to better be there for me, communicated my needs, discussed more details with my therapist, opened up more to my girlfriend, and eventually — and most importantly — stopped demonizing myself. Within one month, I developed a working support system. I finally told my family a little while ago, though the conversation was very difficult. I am privileged they did not completely dismiss me. They had always taught me that “deviations” — such as depression, eating disorders, and anxiety/mood disorders — were byproducts of negative thinking (where my fighter mentality first originated). And though pathologies of the mind devastate as much do pathologies of the body, I was taught only to prioritize the latter. Further, we never had real conversations or acceptance about these issues. In this world, psychiatry was unfavorable. In this world, our familial identity was inextricably linked to our “strength,” vis-a-vis our lack of mental infirmity — awareness absent, and secrecy/shame abound. I know I’m not alone. Nearly ALL my friends live a similar narrative. We strive toward the “model minority” fiction. We set demandingly high expectations. We are then subjected to debilitating pressures — from ourselves, from family, from friends, from society — which lock us into a pressure cooker. What to wear, how to eat, how to behave, are normed, while our communities all the while engage in social comparisons, setting in standards for happiness which are relative — see how he did? see what she’s doing? — and not self-driven. Meanwhile, we suppress, guise our struggles, and bask like perfectionist puppets without proper recourse for vulnerability. Our stories are rendered silent struggles, simple allegories for sorrow, trauma, and strife. Yet, it is these stories which remain the sources of our most profound strength, solidarity, and resilience. My experience, and those of my friends, taught me that it becomes not a question of our own will power, but our search for love, affirmation, inspiration, support from others, and ultimately motivation to wake up anew. Without proper self-care and support — and sometimes, even with both — our minds can suddenly transcend everything we believe we know. With time, self-care, and support, I have since been recovering. And my progress continues today, as we speak, right now. Though I have experienced some relapse this summer, I am happy and I am hopeful. As my inner voice vociferates, I take time away from the world around me, to just be. I enter medical school more ready to accept who I am, what I need, how I will act. My mind is forever powerful; and it is perseverant. I have found a resting beauty within restless chaos; and in this moment, that is worth several lifetimes of peace. If your friend/loved one is experiencing a mental health challenge — from stress to schizophrenia, first ensure your own self-care and support systems are in place. Educate yourself on their struggle — read blogs/stories/articles. Learn what to do when you’re with an actively suicidal person. Ask them “How are you?” from time to time. Embrace them. Listen to them. Tell them you’re there for them. Then be there for them. And check in on them regularly. It is neither a crime to want alone time, nor to prefer talking about something other than mental health. Legitimize and normalize their struggle. Humanize them, their mind, and their capacities. Urge them to seek professional help. Remind them they are powerful, beautiful, creative, loved, worthy, whole, and inspirational. If you are in recovery, you are not alone. We are forever bound by strength. Stay strong, stay hopeful, stay with us. Always. My dream for I-AM SHAKTI was born from the ashes of my post-traumatic struggles. 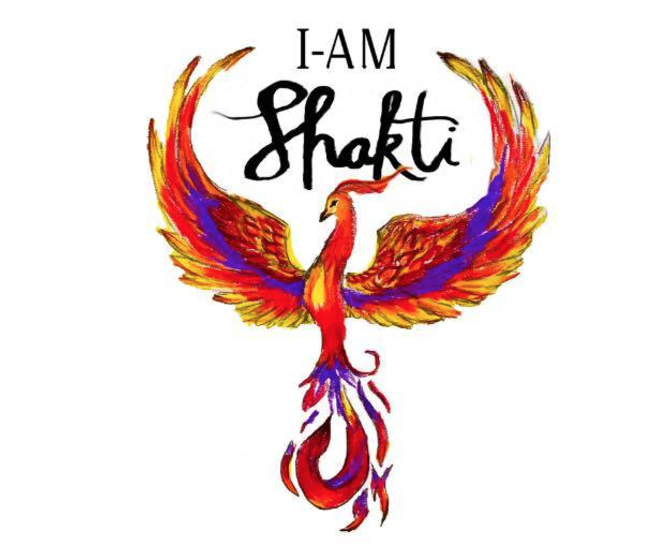 I-AM SHAKTI (translation: “INDIAN-AMERICAN POWER” or “I AM POWER”) is a movement we are launching to sensitize Indian-Americans to mental health challenges while giving hope and support to those affected. Though it started with an Indian focus, we stand as allies in strong solidarity with all Desis and South Asians, and welcome all who wish to get involved. Our symbol is the phoenix, symbolizing power and revival. Mental illness affects people you would never imagine it to. All of us have battled a mental health challenge: insecurities, self-esteem issues, inferiority complexes, self-doubts, sorrows, shames, fears, repressed thoughts, all which exist in flux, all which eat us alive from within. We must crush them before they grow into something more pernicious; conversely we must respond with compassion while we recover. Millions of Indian-Americans (and, more broadly, Desis and South Asian Americans) battle mental illness daily. Parents and elders are affected, too, even when they don’t realize or accept it: Over 60 million people in India suffer from mental disorders. South India has the world’s highest suicide rate for female teens. India alone accounts for >30% of global suicides. Yet, more than 80% of Indians never seek care, offered by less than three psychiatrists per million people. And this is under-reported. In America, the suicide rate among South Asian women is higher than that of the US population, while use of mental health care is among the lowest. In our society, it is sometimes such that the judgements of a few dictate the actions of a many. We will not allow this. For every 100,000 who stigmatize, 1 million will support. Being an activist does not require you to raise a microphone and lead thousands of people. If you are fighting a mental health challenge, and you believe in the transformative capacities of Hope: Join I-AM SHAKTI. If you know your loved one deserves to feel loved, accepted, and unapologetically powerful: Join I-AM SHAKTI. If you refuse to stand complicit with the marginalization of mental illness, and the “othering” of Indian-American, brown, Desi and/or South Asian minds: Join I-AM SHAKTI. imagine what all our voices can engineer together. So, let us send shockwaves through this universe, and become, at this very second, indomitable. Our movement will officially launch in Fall, 2017. Stay alert.